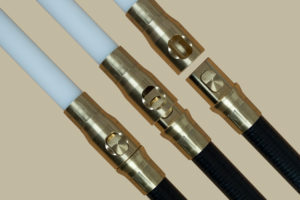 1 meter long nylon rod with 1/2″ BSW hexagonal solid brass joints. Use for sweeping vitreous enamel, lined and twin wall flue systems. Can also be used for power sweeping with rotation in one direction only. These rods are sufficiently flexible to go round bends, but with enough rigidity to be used in long stacks. The solid brass joints are hexagonal to ease attachment and removal with 1/2″ BSW male and female threads. 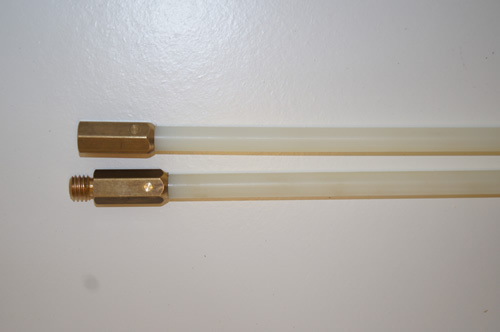 The brass joints are smooth to the 1/2″ nylon rod. All our brushes attach direct to the rod without the need for an adapter. Have used them in the past ,good quality never had a trouble with them not being locking.